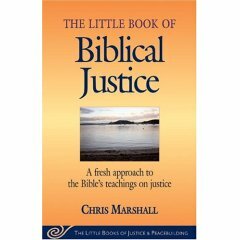 In Chris Marshall’s The Little Book of Biblical Justice, Marshall has done an effective job at attempting to explain the complicated and often misunderstood concept of biblical justice. Of course, it goes without saying that the book is not exhaustive, but it allows to whet the reader’s appetite to explore biblical justice further. Many Christians consider the Bible a source of revelation about social and criminal justice. The Bible helped to shape Western civilization, so it is helpful to explore biblical notions of justice to understand modern day socio-political and judicial thought. Marshall enters into the discussion asserting that there are many complexities when dealing with examining biblical justice. There is much information to process in terms of supporting scriptural passages that speak about justice, the data is also diverse, and the concepts of justice expressed in the Bible is different anthropologically speaking than today’s modern, secular society. He also gets to the basic level of understanding justice. He questions the very nature of justice, its objectivity or subjectivity, and its potential changing nature. There are four key ingredients to the ideas of justice: distribution, power, equity and rights. Later on in the book, he examines that although there many different ways approaching and interpreting God’s justice, there are five basic aspects that connect them all: shalom, the Torah, covenant, deed-consequence, and atonement-forgiveness. He also asserts that biblical justice touches upon every aspect of human, communal existence. He describes shalom as God’s peace: it is a state of soundness and flourishing in all dimensions of existence. He examines Isaiah 42, and it is a clear prophecy about Jesus’ mission as a peacemaker in justice concerns. Marshall also describes covenant as a formal commitment in relationships, and outlines the rights and responsibilities of each party. The Torah is God’s laws and legislation. It is educational and pedagogical; and it is set up in such a way that it could be understood by the lay person. It is meant to be understood by the entire community. Deed-consequence is God’s assurance that that there is a reaction to every action, whether it was positive or negative. Each action has their proper consequence. Atonement-forgiveness is in relation to sin. Sin is considered to be a moral failure that also carries guilt, and it also carries a source of pollution or contamination. A sacrificial offering was needed to remove this guilt, and laying of hands ensured that the sacrifice would carry the guilt for those who sought forgiveness. In the New Testament, Jesus was this sacrificial substitution. Another thing that I had found interesting was the expectations placed on God’s human creation in relation to justice. The very nature of humankind is that we are made in the image of God, so we reflect his essence of justice, mercy and equality. This reflection of God cannot be taken away (hallelujah! ), but this reflection is… dimmed in light of the fact that we live in a broken world. The emphasis that we reflect God’s image to others is something to be joyful of; to take pride in. I muse about how our Christian community can be a better reflection of showing God’s just nature, but much healing must take place so that this can take place. Near the end of the book, Marshall places much of what Jesus’ work on righteousness and justice in the culture of which he was born into in Palestine. Religion and politics were intertwined, as religious leaders had major influence and held power in the region. There are significant highlights to God’s preferential treatment of the poor and oppressed, especially through the completed work of Jesus on the cross. What is important to note is that God’s several attempts to work with Israel as a nation set apart is read through Christ’s final redemptive work. Marshal notes that there have been times that Israel has been righteous, but often had failed at the tasks and duties set aside for her. Reading back through history, there was hope that “grew up that, one day in the future, God’s liberating justice would manifest itself in a new way, restoring Israel’s fortunes and renewing all creation.” In other words, there was hope for a Messiah. Marshall highlights four ways in which Jesus fought injustice in the cultural milieu of his time. Jesus consistently fought social discrimination; spoke out against economic injustice, held a higher standard for institutional power, and denounced war and violence. There was no way in which biblical scholars could separate Jesus from the political nature in which he fought injustice. Many of the injustices that plagued first century Palestine (and arguably, still exist today) are systemic in nature, and hard to dissociate from the political and cultural system. God’s new way of fighting for the vulnerable and oppressed sent His son to the cross for redemption. I had found the discourse on deterrence fascinating. It first came up when Marshall was defining biblical jurisprudence in the Torah, and its relation to the death penalty. What I find interesting is that there are studies done within criminal justice that examines deterrence. The penalty of the crime does not necessarily deter people in committing crime; especially when it involves capital punishment. Caesar Beccaria, the founder of classical (rational) criminology, had thought that punishment would deter potential offenders to not commit crimes because the costs of doing so would deter its benefits. Even in light of his belief in rational criminology, he did not believe that capital punishment would deter people in committing the crimes that would warrant it. Studies done in the 20th century, such as Sellin’s first comprehensive study done in 1959, do back this up. Studies in the 1980’s also do confirm Sellin’s findings. I contemplate whether or not God’s mercy is at the root of this withholding of capital punishment in certain cases in ancient times as opposed to the deterrence theory. Also, I did appreciate discussion about the application of the death penalty within the application of the Torah. Marshall asserts that the Torah is set up in such a way that all the laws that exist in the Bible are meant to support the Ten Commandments, and there are twenty laws that exist that carry the death penalty. He also states that there is no hard and fast rule about the sentencing of the death penalty; it was meant to grab people’s attention and to highlight a warning about the vicious consequences of particular deeds. Later on in the book, Marshall turns back to the notion of punishment later in the book when he talks about it being much more than just a penalty for the offender. He states that it allows communities to discern what offences against the public good are more heinous than others, and adjudicate properly. He also talks about deterrence again, and that penalties allow society to stop copycat crimes. I am not sure whether or not deterrence works in certain cases and not in others, but it is important to state that one cannot disconnect God’s mercy and tenderness with the call for action and social justice. These two are inherently connected, and we must remember to keep it intact. I also appreciated the theme of restorative justice inherent in the Bible. Restorative justice is common in Native American healing circles and stresses that when there is an offence between two parties, both sides sit down and resolve what had happened together. It is a very community based application, and it is meant to allow both victim and offender to be restored back into the same state as before the offence has taken place. Depending on what the nature of the offence was, it can take a long period of time for restorative justice to work through the two parties that were involved. I also appreciate that not only is it common is Native American healing circles, it was stressed with the upmost importance after the 1994 genocide in Rwanda. These were known as the Gacaca courts, and were established at the community level to help prosecute some of the people who assisted in the implementation of the genocide. Our modern criminal justice system has difficulty in implementing the notion of restorative justice because of its internal structure. Both victim and offender do not have the ability to connect on the level needed for restorative justice to work because of various reasons, but it has slowly been starting to be incorporated. I am excited to see more and more of it happening, as it is something that is absolutely needed. Barkan, Steven E. Criminology: A Sociological Understanding Third Edition. Pearson/Prentice Hall. Toronto: 2006. Marshall, Chris. The Little Book of Biblical Justice. Pg 10. Marshall, Chris. The Little Book of Biblical Justice. Pg 49. Marshall, Chris. The Little Book of Biblical Justice. Pgs 53 – 61. Barkan, Steven E. Criminology: A Sociological Understanding. Pg 135. Barkan, Steven E. Criminology: A Sociological Understanding. Pg 137. Marshall, Chris. The Little Book of Biblical Justice. Pg 46. This entry was posted in Bible, Campus Ministry, Social Justice, Theology and tagged Book Review, Christianity, Social justice. Bookmark the permalink. Great thoughts. Appreciate how Marshall pulls the justice conversation into what Jesus did and came to do. Thanks for sharing! Thanks for the comment. I too appreciated Marshall’s connecting Jesus with justice.